Capping off a horrifically depressing news day, Henrique Capriles gave a “major speech” on economic policy today that barely merited the name. 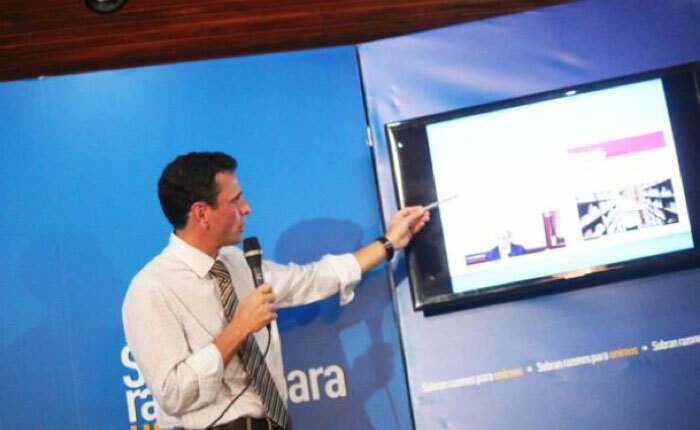 Capriles portrayed himself as presenting a short-term package of emergency economic recommendations, but the speech itself was so disjointed and incoherent it was hard to make heads or tails of what he was proposing. The closest thing to a specific measure in the speech was a call for a 50% across-the-board salary rise as a way of fighting inflation, which is roughly like calling for across-the-board gasoline spraying as a way to fight a forest fire. Remarkably, though Capriles repeatedly referred to some kind of formal document containing his recommendations, nobody seems to have seen it. I’ve been looking for it all afternoon, but it’s just MIA. 74% de inflación en lo que va de año, la más alta del mundo, no hay otro país que tenga esta inflación. La base de todo es la confianza y no hay confianza en el gobierno venezolano, pero hay una gran expectativa. La situación del país no cambia tapando las cifras ni censurando los medios. Es una emergencia la que hay en Venezuela. Hoy hay una hiperinflación sumado a una recesión económica. That feel cobbled together from random bits of an argument overheard at a taguara. Seriously, it was that bad. We’re talking Marco Torres level bad. Earlier today, I posted a pretty harsh critique of Freddy Guevara’s speech for VP on handling our foreign debt. I definitely don’t agree with Guevara, I think he has it badly wrong. But I can argue with him. He sets out a reasoned position, one where conclusions follow in some kind of logical order from premises, values and assumptions. You can pick apart those premises, values and assumptions and have a fruitful debate about them. But I can’t actually do that with Capriles’s speech, because it wasn’t even wrong, it was meaningless. Look, I get it that as a professional politician you’ll inevitably be called on to give speeches on topics you haven’t really mastered. That’s part of the job. If you’re smart, you read those speeches. If you don’t, well…people are going to draw their own conclusions about your judgment.